It is normal to feel a little bit of stress (some level of stress can help you focus), too much of it can lead you to feel out of control and can make it harder for you to take in information. When we feel stressed, the fight or flight response is activated. This may cause fatigue, difficulty in getting up, poor appetite and increased irritability if maintained for long periods of time. It is important that you are aware of where and when you work best. Think about the time of the day that you feel most alert and the place that makes you focus most and where you feel calmest. Perhaps you could alternate your work space to keep revision fresh and to avoid boredom. Find out when the libraries on campus are open. A quick fast food fix may look tempting when you are up late revising. However, your body and brain need proper fuel for revision. Eat fresh fruit and veg, swap chocolate snacks for high protein nuts, and try not to consume too much caffeine to ensure good quality sleep. Factor revision breaks into your study to rest your brain. Reward yourself with something you enjoy, be it a walk in the sunshine, or 20 minutes of your favourite TV show, or book. It will motivate you to concentrate on your revision. It can seem like you don’t have the time to exercise when you are revising, but it actually makes you more productive afterwards! It helps you to de-stress and releases feel-good endorphins. Try walking, going to the gym, or going for a jog. Have you tried the University’s sport services? 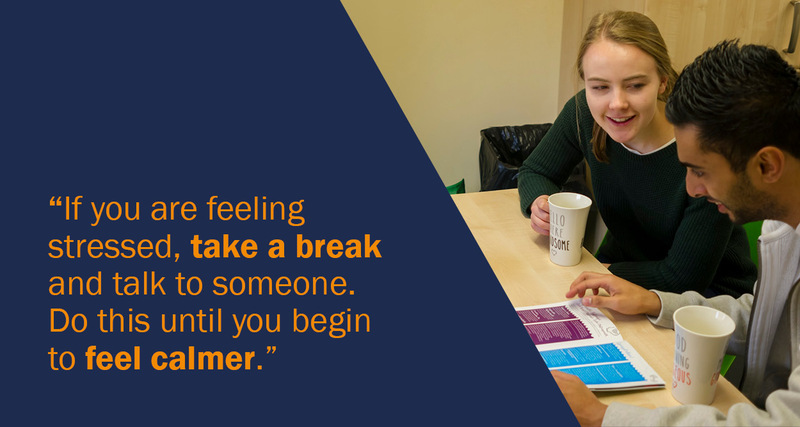 If you are feeling stressed, take a break and talk to someone. If you feel yourself starting to panic, stop what you’re doing and take deep breaths; breathe in through your nose and out through your mouth slowly. Do this until you begin to feel calmer. · Wednesday, 3pm-3.45pm, 2nd floor Cardigan House. Mindfulness can be a way to live life more in the present, thinking less about the past and worrying less about the future. It can help you to live less judgmentally and worry less about the judgement of others. This can have benefits physically and psychologically. It can be about practicing how to be more present and enjoying ‘the moment’, or about learning to reduce stress in your University life through meditation. It can help you right now, and also in the future, giving you valuable skills to carry forward into your working life. Please wear comfortable, loose layered clothing and bring an open mind. These workshops will run on Wednesday 11 January and Wednesday 18 January. There will be two sessions on each date, between 2pm-3pm and 3.30pm and 4.30pm. There is no need to book on to these workshops, so please just come along to Room 302, Student’s Union. The Counselling, Health & Wellbeing team are used to dealing with all manner of things. Our team of professionals offer a confidential service that aims to support students. Please contact us in confidence by email, telephone or call in, whichever suits you best. The Workshops Idea is just a creative way to keep the things lock in mind. as well useful tips to manage the stress of examination. I was also making use of watching movie, listening music and such kind of funky stuffs to keep the things on the limit they should be. The idea of the workshop is just a creative way to keep things locked in the heart. The same useful skills to manage the pressure of the exam. I am also using movies, listening to music and such funky things to keep the limits that they should be. Absolutely correct. These guidelines will be a much helping guide for students who always become under stress when preparing their exams. Without doubt I can attest that the information which is contained in this forum is very useful. There is much details and this brings a good illustration about the subject which is being discussed. In this case, I bet that the author will be updating more about this subject. Exam stress are common for students. We need to avoid stress to perform well in exam. Here the suggested stress avoiding tips are applicable one and hope it will useful for all. Do well in exams. 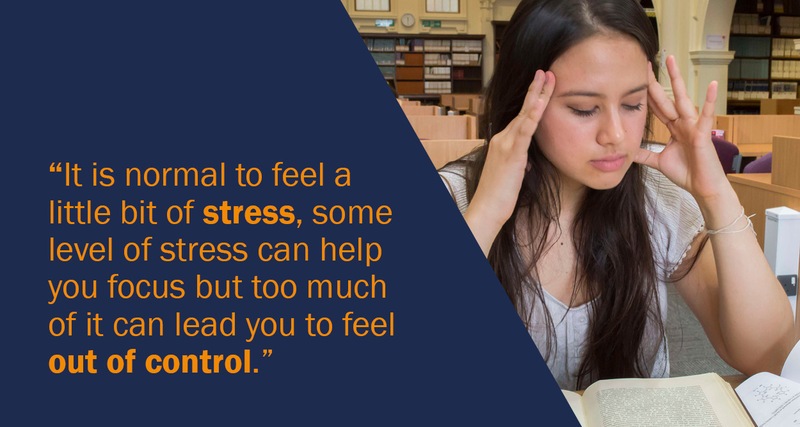 Exam stress is common among students regardless of how prepared they are. The shared tips, therefore, will be of help to a larger percentage of students. Thanks so much for sharing such an interesting piece of information and I am hoping that it will reach out to every online user. The possibility of the workshop is only an innovative approach to keep things secured in the heart. These rules will be a much helping guide for understudies who dependably wind up plainly under anxiety while setting up their exams. I wish if i had read this article when i was in college! Things would have been a lot better. Thank you for sharing this useful information, as a student I can use this in my everyday life to improve my examination mark. Many of my friends also face the same problem; this post may give relaxation to them to avoid the stress. Thanks for this post!! it was great reading this article!! keep posting! would like to know more! thanks a ton for the share! thankyou for sharing this tips here. its really working and now i can concentrate more in my studies. it helps me to get high marks in exams. Great article. It would be really helpful for school and college students. I used to get stressed out during my examinations at college and when i was preparing for entrance. Exams are really stressful but ya there are ways to overcome the stress!! Exam Stress is common for all students..This Article is very helpful for students.This article tells how to manage exam stress.Thanks for sharing this helpful article. It is very helpful article. This article describes how to manage Exam Stress.Time Management , Planning …… etc. Plays important role. This article gives the tips to manage exam stress.This article is very helpful for students.